The Ditsong National Museum of Natural History (DNMNH) and the Max Planck Institute for Evolutionary Anthropology (MPI-EVA) established a collaboration in 2010 to scan fossil hominin specimens housed at DNMNH using microtomography (microCT). The goal of this collaboration is to facilitate research and create a ‘virtual copy’ of the fossils for the DNMNH records. 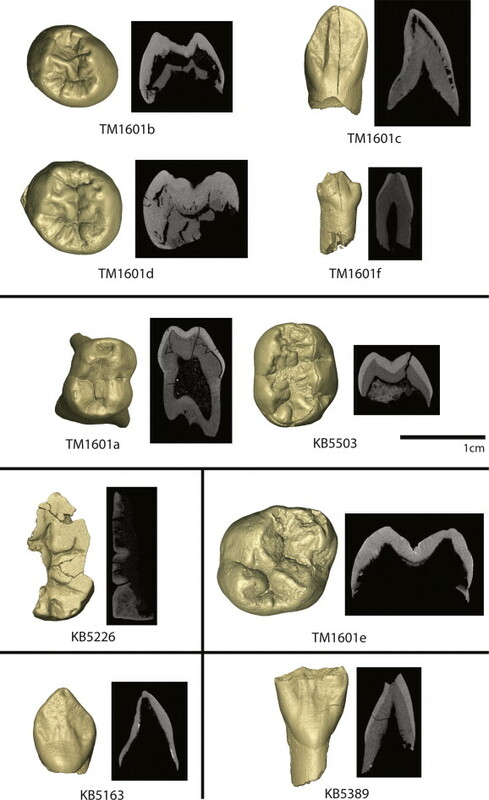 Within the context of this ongoing collaboration, the focus of this contribution is the fossil hominin material from the site of Kromdraai B, South Africa. The goals are to 1) formally publish the microCT scans of the Kromdraai material and facilitate their availability to the scientific research community, 2) address uncertainties regarding specimen accession numbers, 3) highlight internal aspects of anatomy revealed through the microCT scans, and 4) clarify the hominin status of a number of postcranial specimens. Finally, 2D images of surface models, a 3D PDF surface model, a movie of each microCT volume, and the original microCT volume of each specimen are made available via an open access online archive (http://paleo.eva.mpg.de). Figure 3. Isolated teeth: Individual 5 (top) includes TM1601b LLP3, TM1601c LLC, TM1601d LLP4 and TM1601f LRDC; Individual 7 (upper middle) includes TM1601a LRDM1 and KB5503 LRDM2; Individual 8 (lower middle right) includes TM1601e ULM1; Individual 4 (lower middle left) includes KB5226 LLM3; and two specimens (bottom) not associated with an individual, KB5163 LRC and KB5389 ULI1. CT images are through the mesial cusps of postcanine teeth and in midline of a labiolingual plane for anterior teeth. Figure 5. 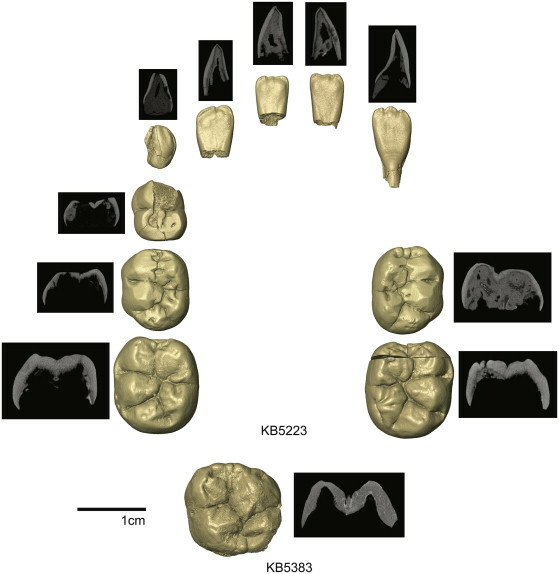 Specimens associated with Individual 9: KB5223 isolated mandibular teeth, including LLI1, LLI2, LLDC, LLDM1, LLDM2, LLM1, LRI1, LRI2, LRDM2 and LRM1. The KB5223 LLC was not available for scanning and is not imaged. Also associated with this individual is the KB5383 URM1. CT images are through the mesial cusps of postcanine teeth (with the exception of the LLDM1 that is through the distal cusps) and in midline of a labiolingual plane for anterior teeth.